Sidney and the Pittsburgh Penguins finally found out who there next opponent would be in the playoffs, the Carolina Hurricanes. This was going to be a seriously awesome match up because both of these teams were doing extremely well and both teams wanted to move on and not have their dreams of winning the Stanley Cup be taken away. Everyone was excited and ready for some serious action and a great series. Carrie had enjoyed the fact that Sidney had actually chilled out for a little while while they waited on who they would play next. And they both had called their parents to tell them that Carrie was pregnant. Both sets of parents were surprised by the news but everyone was happy about the new bundle of joy that would be coming in 9 months. Sid told his teammates and they were all surprised but happy for him and Carrie. "Dude I can't believe you got Carrie pregnant. Congrats" said Marc Andre giving Sidney a slap on the back. "Thanks Marc" said Sidney with a huge smile on his face. "So Sid are you ready to be a dad?" asked Jordan Staal looking at his teammate. "I don't know but its gonna happen not matter what because I got Carrie pregnant" Sidney said as he sat down in his locker spot. "Hey its amazing being a parent Sid. Congrats" said Sergei Gonchar as he shook Sid's hand. "Thanks Gonch. I appreciate that and I hope I am as good a father as you are sir" Sid said as he started getting ready for practice. Several more of Sid's teammates congratulated him on being a father as they walked around the locker room getting ready for practice. Practice was long and hard but that is what was necessary so that the Penguins could win against the Hurricanes. Carrie had gone down to watch the guys practice with her twin brother, Craig. Craig had surprised Carrie that morning at her condo for a visit. She was thrilled to have her twin brother come and visit. Craig played hockey in college and that is how Carrie got interested in the sport and the media aspect too. Craig had played in college and was drafted by the Phoenix Coyotes and played for them. He was good and loved that Wayne Gretzky was his coach. Since the Coyotes were out of the playoffs Craig decided to come and visit his twin sister and when his parents told them she was pregnant they wanted him to go and check on her. Craig did not mind checking on Carrie but he knew she would not be happy about that plus he wanted to make sure that Sidney was really going to be there for his sister. 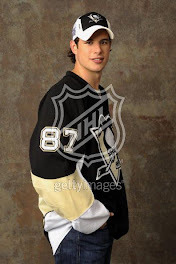 "Hey Sid whose the guy sitting with Carrie?" asked Jordan nodding towards where Carrie was sitting in the stands. Sidney looked at where Jordan was talking about. "That's Craig Addison, Carrie's twin brother and he plays for the Coyotes and I have no idea why he is here though" Sidney said looking up at where Carrie was sitting. Carrie waved and smiled at Sidney and he waved back. "Oh ok I was just making sure he was not here to make trouble. If you know what I mean, man" Jordan said. "Thanks Staalsy. Its all good" Sid said as he skated off. Practice was over and Sidney went to go and find Carrie. He found Carrie and her brother sitting at her desk talking. "Hey guys what's up?" asked Sidney. "Hey Sid nothing much just talking. It looks like you guys were put through the paces today at practice" Carrie said smiling at Sidney. "Yeah we were but if we want to win we need to do that" Sidney said smiling back at Carrie. "Hey Sidney" Craig said shaking Sidney's hand, "Congratulations on the baby." "Thanks Craig, I am excited about being a father" said Sidney. "I hope so" said Craig looking seriously at Sidney. Carrie looked at both men and then decided to calm the situation before an argument started on her behalf and she did not want that at work. "Guys lets go and get some lunch. Me and the baby are starving" Carrie said standing up and looking at both guys. "Good idea Carrie" said Sidney he pulled her to him and gave her a quick kiss. They all headed out to go get some lunch. At the restaurant they were seated and as they were looking at their menus, Carrie kept watching them and hoping that neither of them would start something especially since they were in public. The waiter came and they ordered and then Craig decided to question Sidney about the baby situation. "So I really hope that you know what you are getting into with my sister Sidney and that you are not going to bail because it becomes to hard" Craig sternly said to Sidney. "Man that is not my intentions at all. I want to be with Carrie and our baby. I was the one that started this relationship in the first place so don't get all high and mighty on me Craig. I love Carrie very much and am going to be there through thick and thin" Sidney countered back at Craig. Carrie sat back and watch the two of them talk about her and the baby like she was not even there. Carrie then realized why Craig was visiting and it was not just because he wanted to hang out with his twin sister it was because her parents wanted to make sure someone in the family was watching out for her. "Ok enough guys that's it. I am not going to be stressed out at lunch today because you two want to act like macho little boys. Craig, I love Sidney and I want to be with him and I know he wants to be with me and our baby. And I realize now that mom and dad sent you out here to watch out for me but I am an adult and I will be fine. I am glad that you are here and I hope that the supervision idea that our parents really sent you out here for is over now. Got it Craig" Carrie said with purpose as she stared down her twin brother. "Yeah Carebear I am sorry. I was just being as you know my overprotective self and doing a favor for mom and dad. I get it now and for the rest of my trip, I am here to have fun and hang out with you guys. I am sorry Sidney" Craig said. "I am sorry too Craig and I hope that you can enjoy your trip here in Pittsburgh" Sidney said smiling as he put his arm around the back of Carrie's chair. "Good now let's eat" Carrie said as she looked at her brother and Sidney. After lunch they all headed back to the arena. Sidney wanted to go and workout more and Carrie had things to do at her desk and Craig was going to head back to Carrie's condo because Sidney said he would take Carrie home. Finally Sidney was done for the day and so was Carrie so they headed back to the condo. When they got there Craig had ordered dinner and was waiting for them. "I hope you guys don't mind I just decided to go ahead and get Chinese for dinner" Craig said. "Sounds good to me" Sidney agreed. "You know that's my favorite, Craig" Carrie smiled as she gave her brother a hug. They sat at the table and ate their dinner and actually had a calm conversation. That evening everyone was tired so they all headed to bed early.